Scenarios can be an effective way to engage your learners and really change their behavior. 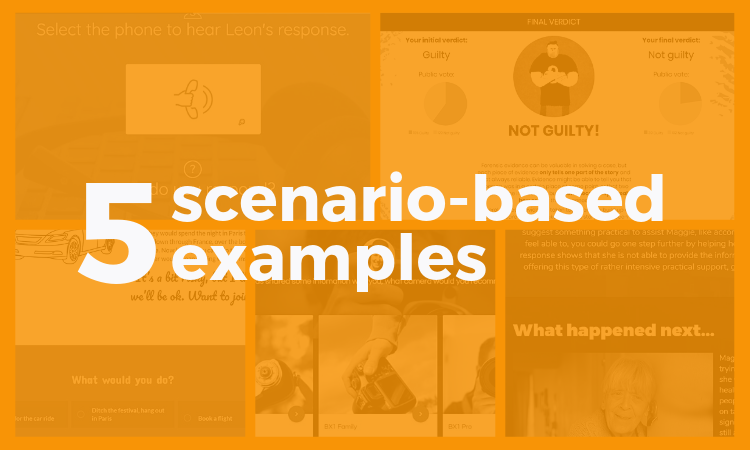 Here are five scenario-based training examples to inspire your next project. Here are five scenario-based elearning examples, each with a different approach. A scenario can be a great way into a topic that is complex, dry or otherwise tricky. In this example, the story draws the learner in and primes them for the core content about ethical dilemmas and decision making. When you need to train staff up on a new product, you could just give them the product information. But this example shows how taking a scenario-based approach to test that knowledge can be more engaging and more effective. Sometimes it pays to develop a more immersive, branching scenario – like this Open University example. This works really well when you want to offer experiential learning online and need the learner to engage emotionally with a subject. A scenario can test a learner’s assumptions and potentially change their mind. This Open University example – about contrasting ways of viewing the same pieces of evidence – illustrates this perfectly. Five examples of scenarios in elearning, each used in a different way. If you need to make your content more engaging, more impactful, more relevant and relatable, elearning scenarios could be the way to go. Feeling inspired? Ask us for a free trial of Elucidat and see what you can do.